ERIE, Pa. — CHMA Playoff hosts Mercyhurst and defending CHMA playoff champion John Carroll each took care of business Saturday, earning spots in Sunday’s CHMA championship game. Mercyhurst held the Pitt Panthers scoreless in the first period of their game, even outshooting them 11-7. Pitt finally got on the board early in the second period, taking a 1-0 lead. With just over seven and a half minutes remaining in the period, a roughing penalty by Pitt’s Jonathan Fair and a holding penalty by Mercyhurst Captain Jordan Ciezki gave the fans some 4-on-4 hockey; at least until Keaton Hanna got called for slashing a minute later, giving the Lakers their fourth power play of the night. It was no surprise that they took advantage of another gift horse and tied the game with a goal from Dawson Richard, a Wexford, PA product. Mercyhurst took advantage of another power play closer the end of the second period as Zack Kisel burried the puck into the net with the Panthers’ Michael Klena in the box for interference. The Lakers would add another goal early in the third period by Pavel Nayda to put them up 3-1. The Panthers would attempt a comeback, bringing the game within one halfway through the third with a goal by Jake Sontag, but Mercyhurst held on to eliminate the two-time regular season champions from the playoffs. In all, Mercyhurst was 2-for-6 on the power play and Pitt was 1-for-2. Later in the evening, a thriller unfolded between the “other” Robert Morris Colonials hockey club and the defending CHMA playoff champion John Carroll Blue Streaks. In contrast to the earlier Pitt-Mercyhurst showdown, which featured 10 penalties called between the clubs, this game was noticeably cleaner, with only three penalties on John Carroll and a single penalty on Robert Morris. Robert Morris jumped to a quick 2-0 lead in the first. That score held for quite some time, as it took until the 6:10 mark of the second for John Carroll to get on the board. They did so in spectacular fashion, netting a short-handed goal after Junior defenseman Jake Denner went to the box. The Blue Streaks tied the game, 2-2, halfway through the third and then took the lead a few minutes later. With 7:20 left to go, however, the Colonials fought back to tie the game, 3-3, and send it to overtime. 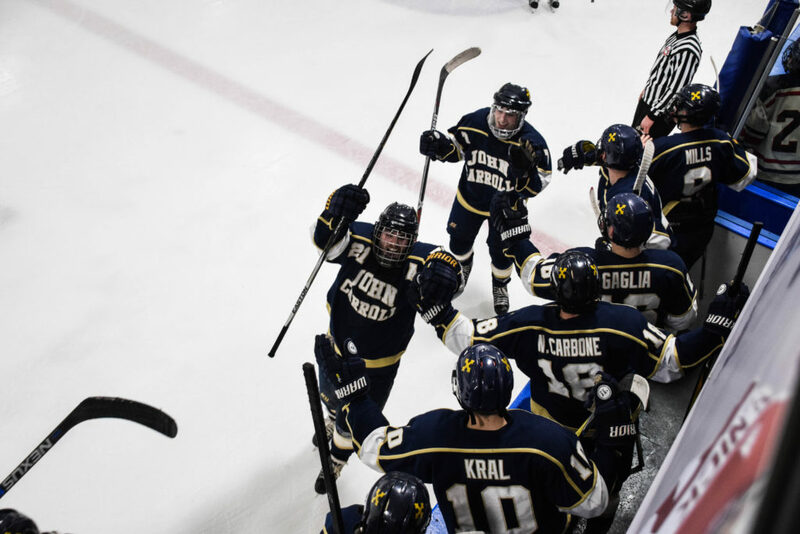 It only took about seven minutes for John Carroll to net one for the win, though, as they toppled the #2 seed to secure their place in the championship game for the second year in a row. No. 5 Mercyhust will face No. 3 John Carroll on Sunday, February 25 at 2 PM at Mercyhurst Ice Center for the CHMA championship.